Demos of these components are available at PrimeFaces Labs Showcase. Don’t forget to check them out with different themes. I’m quite a fan of these new components and really enjoyed creating them. We now go back to 2.x for the next week’s 2.2.1 maintenance release and return to 3.0 development next week. I’m a fan of those new components too and the seem to be stable. Any chance to include them into PF 2.2.1? Good Work. The new components look great. @Stephan thanks but I think 3.0 is better for these stuff. 2.2.1 branch is created for maintenance only. Will the maintenance in 2.2.1 committed to the 3.0 branch as well? So ones 2.2.1 is out I could try to use PF 3.0 SNAPSHOT in production. Very good, but I found some errors and have suggestions, post where? Sure, fixes go into both 2.2.1 and 3.0, only new stuff goes in 3.0. Weslley, you can use PrimeFaces forum to provide feedback on these beta implementations. Ohhh, I’m really impressed by your speed and effectiveness!! It’s only 3 weeks passed since I started using PF with JSF 2.0 (previously there were 2 years with RF, Seam and JSF 1.2), but I’m really excited to see so many results during these 3 weeks! Great work guys! Nice one!!! It would be nice too the same integration with the h:inputSecret don’t you think? How can I make autocomplete control looks like other JSF components (remove styling). After update my forms look very inconsistent. I don’t want to be negative, and this may be colored by the needs of my project, but I think that instead of adding new features to Primefaces, it would be better to put more effort into fixing the numerous bugs in the existing components. I’m using many of the advanced features of datatable and run into a lot of nasty bugs, especially when combining them. Is there any plan to have an option to turn Theme styles off for input controls? If there is not it will be very difficult to use PrimeFaces with other components including standard JSF components. 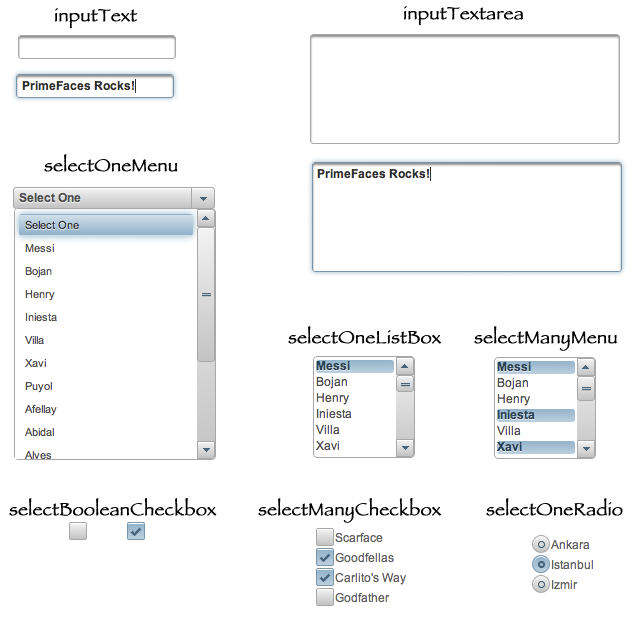 I realize we can overide the styles but that means we need to apply a style to all form controls in the application. They do look really nice but it will be inconsistent with other components.